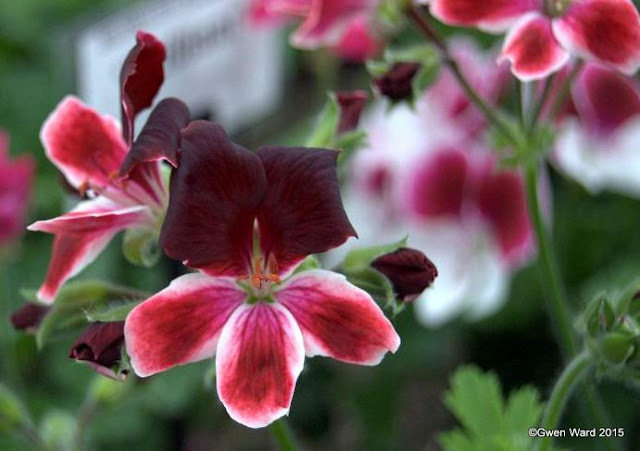 A pretty miniature zonal pelargonium, “Mantilla” was hybridised by the Rev. Stringer and introduced in 1969. “Mantilla” has single orange flowers with a white eye. The green leaves have a slight zone. Several years ago Brian, my husband, who is not a gardener, decided he wanted to grow bonsai trees. Every time we went to a garden centre he would look at the miniature trees, and often buy one. We soon had a collection of tiny trees on the window ledges in the house and conservatory (I think he was trying to outnumber my pelargoniums in the conservatory). As these tiny trees were growing indoors they needed daily misting, so he would traipse backwards and forward from kitchen to sitting room or conservatory to mist his little trees. Not being a gardener or even, I dare to say, a great lover of plants, he soon got bored of the daily traipse. So the little trees soon disappeared from our house. I kept the trays though as I had in mind an idea I had read about – bonsai’d pelargoniums. Fast forward to last year when I visited Toronto in Canada and the Ontario Fuchsia & Pelargonium Society Annual Show. They have a class for bonsai’d pelargoniums and fuchsias. They were all very good, but one really interested me. It was a bonsai of the scented leaf P.bontrosai – a sport of P. graveolens , and has curly leaves and as a bonsai reminded me of the Japanese Cloud Trees. So on my visit to Fibrex Nurseries last week I got a small P.bontrosai, found one of the small bonsai trays and potted up the P.bontrosai. I was enthused to then look for another miniature I could ‘bonsai’ and found a pot bound P. Sandown in a 3” pot. Then stem had hardened to brown, an ideal candidate. (I am ashamed to say it was rather old but I have another two growing well). So, here they are, and I have to say I am delighted with them. I feel another interest coming on! 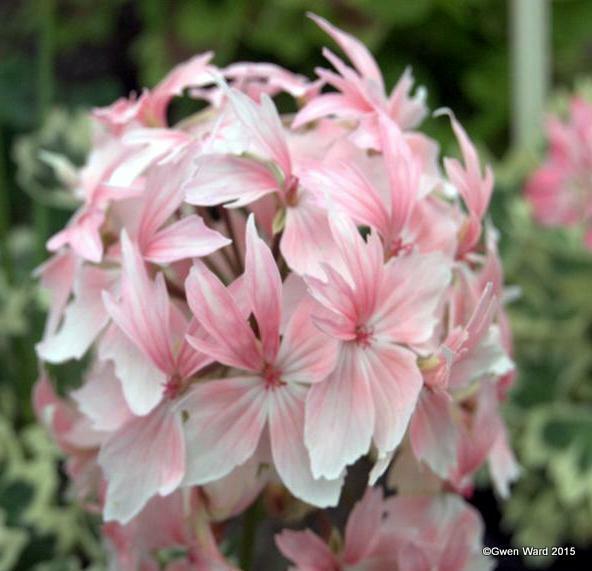 If you've grown bonsai pelargoniums, or decide to have a go yourself, do let me know. I would love to hear about your experiences with these bonsai's. Tri-coloured zonal pelargonium "Alan Shellard"
One of the nicest of the coloured leaf pelargoniums the tri-coloured zonal “Alan Shellard”. 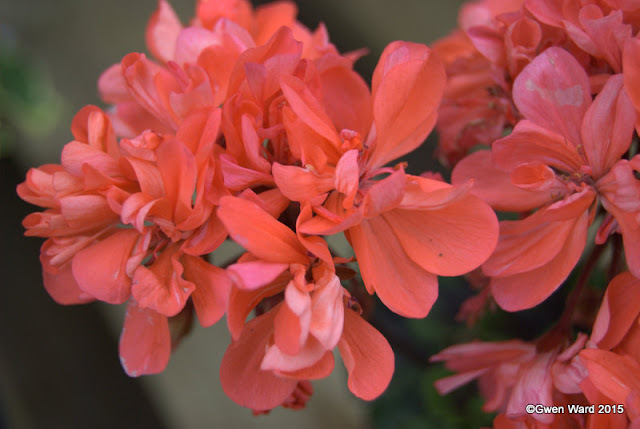 This has bright double salmon coloured flowers and was introduced by Andrew Simmons in 2008 through Sulman’s Nursery. Many of you will be familiar with the name Alan Shellard – he was a well known hybridiser himself and the author of two books about growing pelargoniums. Alan Shellard’s books are well worth getting hold of if you can and they are a wealth of useful information. 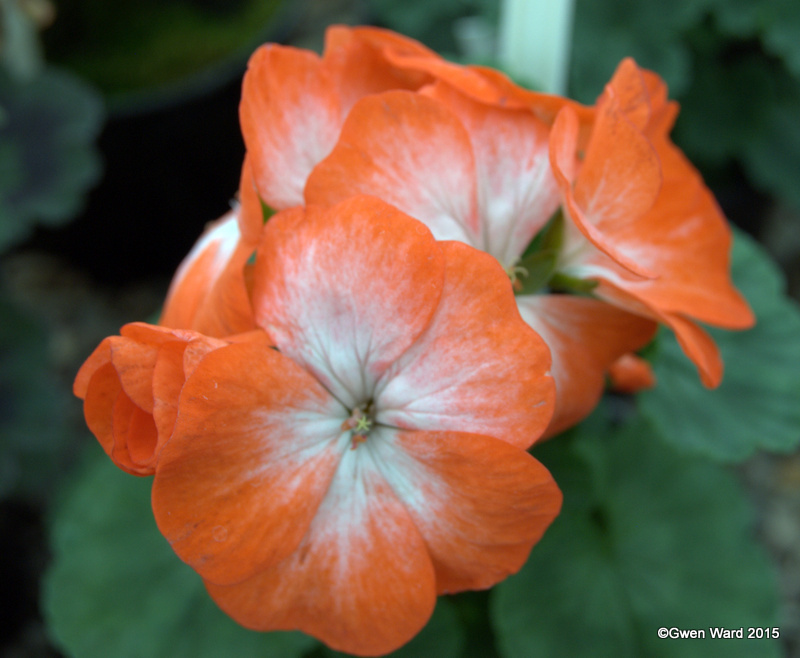 One is “Geraniums for Home and Garden” and the other, “Growing and Showing Geraniums” is one I refer to fairly often with plenty of information on how to prepare your pelargoniums for the show bench. You can try the Bookshop of The Pelargonium & Geranium Society – they often have used books for sale, and if there is one you are particularly looking for the Book sales Officer will let you know when he has one available. 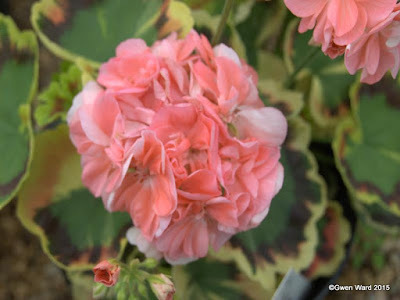 Wordless Wednesday - 22/07/15 - Stellar Pelargonium "Barbara Lambert"
Hybridised by Brian West and introduced through Denmead Nursery, “Colwell “is a miniature zonal pelargonium. The semi-double flowers are a dark peach colour and the leaves are green. This is a cross between Peggy West and Little Alice. I went to The RHS Hampton Court flower show on Sunday with my friend, Marie. We had a wonderful day. It is a really huge show and we think we saw pretty much all of it. Yes, we did buy some plants – even though Marie was quite definite that she would not! Sadly I did not get any pelargoniums. Fibrex Nursery had had a very good week and did not have anything I wanted. Here are some of the photo’s I took – enjoy! I thought these were 'neat'. They are the topiary shapes you can buy in the garden centre - filled with moss and then these succulents grown in it. They make a good alternative to the usual box plants. Now I look forward to next year's Hampton Court Flower Show.